The Columbia River 1062 Directive is an everyday carry folder that takes its design from tactical knives. 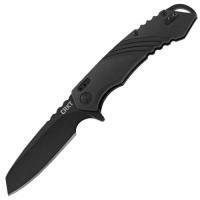 It features a sturdy tanto blade that delivers maximum strength at the tip for easy, efficient penetration. The blade deploys easily using a manual, one-handed flipper, and its locking liner keeps it securely locked open. A thumb rest at the base of the spine provides enhanced control for detailed work. The black oxide coating reduces wear on the steel while preventing telltale reflections. The knife's glass-reinforced nylon handle is ergonomically curved for a comfortable grip, and its sculpted shape and textured sections increase security. It comes with a convenient pocket clip for portability.